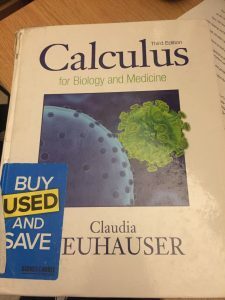 Calculus 1156. I never thought these words would hold such an important meaning to me. However, after only one midterm and a few weeks of calculus, I know this semester is going to be a journey. Before college, schoolwork was never an issue for me. Basing my experience off of high school, I assumed college would not be much different. However, I realized this was not the case as I go through calculus. Having information come to me “naturally” is not a concept anymore and no longer is not studying an option. This class especially holds meaning for me because it truly established the changes I would need to adapt in college. I was surprised by the amount of time and effort I have to put into understanding the concepts in this class. Calculus has not only taught me the mathematical concepts but also the importance of preparation and commitment. Lot’s of preparation is required in this class and I am slowly learning to become better at it. Also, daily commitment to studying, completing homework, ad knowing when to ask for help has taught me the importance of being committed. These are ideas and concepts that I am able to apply to other classes I am currently in as well as whats in my future.